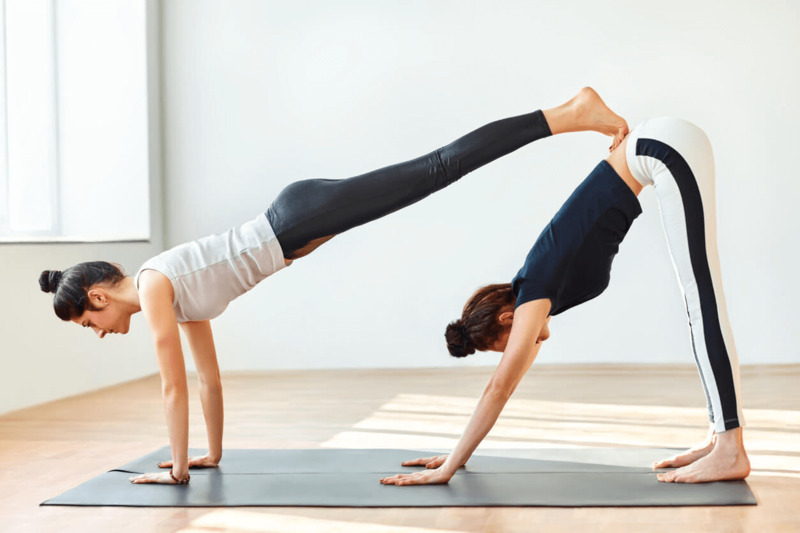 Takeaway: Partner yoga can be a great way to expand your practice and grow your connection with your practicing partner. Here are 5 poses to try with a partner! Yoga tends to be a solo activity. You show up to your own mat, practice your own postures, tune into your own breath, and if you’re lucky, experience the job of deep connection with yourself. Physically, working with another body can assist you in moving deeper into postures. It can also provide additional sensory feedback as to where your body is, and on a practical level, a partner can be a fantastic support for balance. On an emotional and spiritual level, it’s worth remembering that the word yoga itself comes from the root word yog, meaning “to yoke” or “to unite.” When you practice with a partner you can deepen your experience by uniting not only your body, mind and breath, but integrating theirs too. By connecting with another person’s yoga practice, you enhance your own. Perhaps most importantly though, partner yoga is a lot of fun. Negotiating the challenges of working with different body shapes, types and balance issues brings a new playfulness to your practice. It’s the perfect way of bonding with old friends or making new ones. Some believe it can even boost intimacy and healthy communication in relationships. Here are a few introductory yoga poses to try with a partner, ranging from the simple to the more challenging. If your partner is a very different height to you, it may take a bit longer to find the shapes that work for you, but this is all part of the fun. Just keep communicating with your partner, relax and don’t let it get too serious. For this first exercise, sit cross-legged, back to back with your partner. Initially just focus on this connection, finding the magic balance where you are both supporting and supported by your partner. Take your attention onto your breath and begin to match your breath to that of your partner. As you inhale, sweep your arms up over your head, finding your partner’s fingers. If there’s a height difference this may take some waving around to find! Then as you exhale, both of you twist to the right, keeping your backs upright and together. Take your left hand onto your right knee, and your right hand onto your partner’s left knee (it’s easier than it sounds once you try it!). Hold here for a few breaths, inhaling to lengthen your spine, exhaling to deepen the twist. Enjoy the support of your partner and the leverage of your hands. Inhale to come back to centre sweeping hands up over your head, and exhale twist to the left, again holding for a few breaths. You can continue to flow with the breath, always inhaling to centre, exhaling to twist. This is such an enjoyable way to practice tree pose, with your fellow tree to support your balance! Stand side by side, hip to hip, wrapping arms around each other’s waists. Bring your outside leg into tree pose, and your outside hand to join your partner’s opposite hand in a prayer position in front of your chests. Press your palms together and feel yourself rooting into the ground, supported graciously by your partner tree. You can then grow your trees together by reaching your outside hands up overhead. Experiment also by gently moving together as if swaying in a breeze. See how different having your partner there makes the balancing experience! Before you play with this lovely double balance boat pose, make sure you’re nice and warm, and have done some work to release your hamstrings - it will make all the difference. Sit face-to face with your partner, with your knees bent and the soles of your feet on the floor. Clasp each other’s wrists and lean back. Play with taking your left foot and your partner’s right foot off the ground, and connecting the soles of your feet in the air. You can extend your legs or keep knees bent - you will probably need to adjust how closely you are sitting to find the perfect point. Play with the other leg, leaning back, and finding more lift through your chest. Finally, see what happens when you try both legs together. You’ll need to rely on your partner’s support more, but make sure you also engage your own core to support them, and keep your heart lifted. You may find you can extend both legs fully or keep the knees as bent as you need to. This is the most challenging posture of this little set, and is a perfect introduction to acroyoga - a more dynamic, acrobatic style of partner yoga. But, it’s actually much easier than it sounds, and can feel great for both partners. If in any doubt, ask another friend or a teacher to “spot” you as you try it. Have your partner come into downward-facing dog, and make sure they feel stable and secure there. Bring your feet to the outsides of their hands, facing away from them, then place your hands on the ground about a foot in front of their hands. One foot at a time, step your feet up onto the outsides of your partner’s lower back and straighten your legs to bring your hips over your shoulders (you can keep a soft bend in your knees here if it helps). The balls of your feet want to find the bony landmarks at the top of your partner’s pelvis, well away from their spine. This will give them a lovely lower back release, and because most your weight is in your hands, you get to build upper body strength too, while they’ll be amazed by how light you feel. To come out step down one foot at a time - no jumping! This is the ideal last pose together, as it’s a surprisingly restorative experience for both partners - make sure you switch around after trying it so you both experience all the benefits. Be aware that if either of you have any knee tenderness in child’s pose, you may want to give this one a miss. Have your partner come into extended child’s pose, with their arms reaching out in front of them. Make sure they’re really comfortable, using any props or support they need. Move as if to sit on their sacrum, facing away from them, and align your pelvises, then slowly and gently lower yourself down over their back. If you are much taller than your partner, you might need to move your hips a bit lower. Keep communicating with them to make sure that it feels good. Once you are lying down over their back, you can extend your arms over your head, perhaps linking fingers with them, to experience a delicious supported backbend. To feel even more of an opening, you can also extend your legs straight. Your partner will benefit from a grounding lower back release. Hold for 5-10 breaths then gently ease your way out and help your partner up. Partner yoga is such an invigorating, bonding practice, you’ll want to end with lots of gratitude and appreciation for your partner. You may also feel you need some time to come back to your own centre, so if you can, set a timer to practice a 5 minute savasana back on your own mats. This gives you chance to re-calibrate and absorb the benefits of your partner yoga practice.